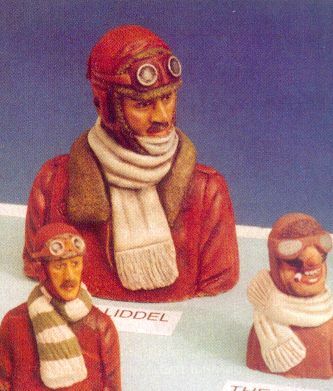 Dave has recently (2001) produced an outstanding range of pilot figures for model aircraft in various scales and of different periods. They are made of a rigid foam, with a solid skin on the outside. They are very light (the smallest ones weigh less than 1 gram), superbly modelled, and can be made even lighter by hollowing them out a bit with a burr on a small drill. The detail is crisper than on vac-form pilots, and you don't have to glue the two halves together. Some of the pilots are based on real people - for instance I bought a very nice 1/16 scale pilot for my Albatros D.V and found he was Bruno Loerzer! The modelling of the figures gives them real charactor. Pilots come in various scales from 1/8 down to 1/35, and from the WW1 period through to the early WW2 jet pilots and the Korean War. Soon to be added are some small modern jet pilots with "bone domes" to suit Jetex and Rapier scale models. Prices are very reasonable considering the quality - ranging from �to � depending on scale. Drop a line to Dave Banks to get a copy of his list. He will supply mail order - in the UK, orders over �are post free. Not sure about overseas - I think it is unlikely he will take credit card orders. Derek Knight is a familiar face on the UK F/F scale scene, as are the products produced by his company. Best known for their range of electric motors and accessories (props, battery packs, jacks, sockets etc. ), they also produce rubber motor winders in 5:1. 10:1 and 15:1 ratios, a neat adjustable nose button for small rubber models and a very useful Sodastream adaptor for CO2 models (allows you to charge the motors using one of the large CO2 cylinders fitted in drinks dispensers). There are currently three sizes of geared electric unit available - the KP 00 will fly scale models up to about 20" span or so (duration types can be a bit larger), or a weight of approx. 45 g - you can use one, two or three Sanyo 50 mAh cells to suit. The familiar KP 01 now comes only as a three cell unit - this will fly scale models up to 30" span or so, and a speed trimmer is available to control the power. I have one of these units fitted to my Douglas Y10-43. The KP 02 is a large and powerful unit - not far off the performance of a 0.75 cc Diesel. Suggested maximum model size is 1 metre (40") wing span, or 280 g weight. It runs off 3 x 110 mAh cells. Recent additions to the KP range are a electric ducted fan units with different diameters plus speed controllers to go with them. I'm sure Derek will be happy to send you his latest list if you contact him.